- How do I get my certificate of achievement reissued? I have recently requested my certificate -- what is the status? Visit http://elearning.pharmacist.com/certificate-of-achievement for information to request your certificate of achievement or how to find a certificate that has been recently reissued. - I need to redeem an enrollment code. I need to look at courses in which I have recently enrolled. Where do I go? On pharmacist.com, select LEARN on the purple navigation menu bar, and then select My Training. - How do I find APhA’s Education products? Where do I find organizations that host APhA’s certificate training programs? How do I enroll? 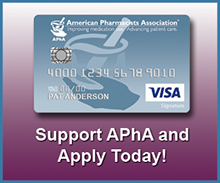 Discover APhA’s education products and how to enroll by visiting http://elearning.pharmacist.com/locating-an-apha-education-product. You can also browse the organizations hosting our certificate training programs to pharmacists outside their organization using that same webpage. - Why am I Being Asked for an National Provider Identifier (NPI)? Which NPI Do I Provide? For answers to these questions, including a link to NPI's Registry, visit http://elearning.pharmacist.com/npi-questions. - I have just enrolled in a Program - Where Do I Access It? For the answer to this question, and answers to other enrollment FAQs, visit http://elearning.pharmacist.com/accessing-content. - How do I obtain my CPE credits? Where are my transcripts of CPE? I cannot find my credits on CE Broker; what do I need to do? For answers to these questions, visit http://elearning.pharmacist.com/obtain-cpe-credit-transcript-ce-broker. - Who do I contact for APhA’s InfoCenter, APhA's Education team, CPE Monitor, and/or Education Technical Support? You can find the full roster of contacts for all things Education at http://elearning.pharmacist.com/who-to-contact-education. - My professor says that I need to change my designation to student pharmacist in APhA’s Learning Management System. How do I change this? If your designation has changed since you were last in an APhA Learning Activity, or if you have incorrectly designated yourself, get the step by step instructions and/or watch the tutorial video today. - I have a Pennsylvania pharmacist license. What requirements are needed so I can immunize in Pennsylvania? I need my page 2 signed. Who do I ask to sign it? You will need to register with the Pennsylvania Board within 2 years from the date of the immunization program which you attended. Find these answers and view the requirements at http://elearning.pharmacist.com/certificate-of-achievement-pa-board. - Where is my Admin Dashboard? Where is my Coordinator Kit? My Organization is a Licensed Partner of APhA - Our coordinator has changed - Who do I need to contact? Coordinators of our Licensed Partners will find their management tools in their respective Coordinator Kits and on their Admin Dashboard.Find these answers and more at http://elearning.pharmacist.com/apha-coordinators. - What technology requirements do I need to complete an APhA online course? Do you have some troubleshooting tips that I can use? Visit http://elearning.pharmacist.com/technology-troubleshooting for Technology Requirements and Troubleshooting Tips. Still need help? Reach technical support with our vendor, Conduent (formerly LearnSomething) at 1-877-399-4925 or help@learnsomething.com. Make sure to provide screenshots too! - What is APhA ENGAGE? APhA ENGAGE is a collection of online communities for APhA members: student pharmacists, new practitioners, specialty pharmacists, and more. - What is my username/password? You will use the same username and password that you use to log into http://www.pharmacist.com. If you have forgotten your login credentials or need assistance with your login information, you can select "Forgot Password?" or "Forgot Username? ", and reclaim your password.